Everyone benefits from a good night's sleep, but how do you tell if it was good or bad? People spend hundreds of dollars visiting sleep clinics or buying complicated CPAP software that helps identify sleep patterns. Unfortunately sleep clinics are not ideal for daily lifestyle changes and CPAP equipment requires a medical prescription. So how can you tell if a different mask is changing the quality of your sleep? Is the new medication helping? Does going to bed earlier really matter? Should you stop drinking coffee after 2pm or 5pm? 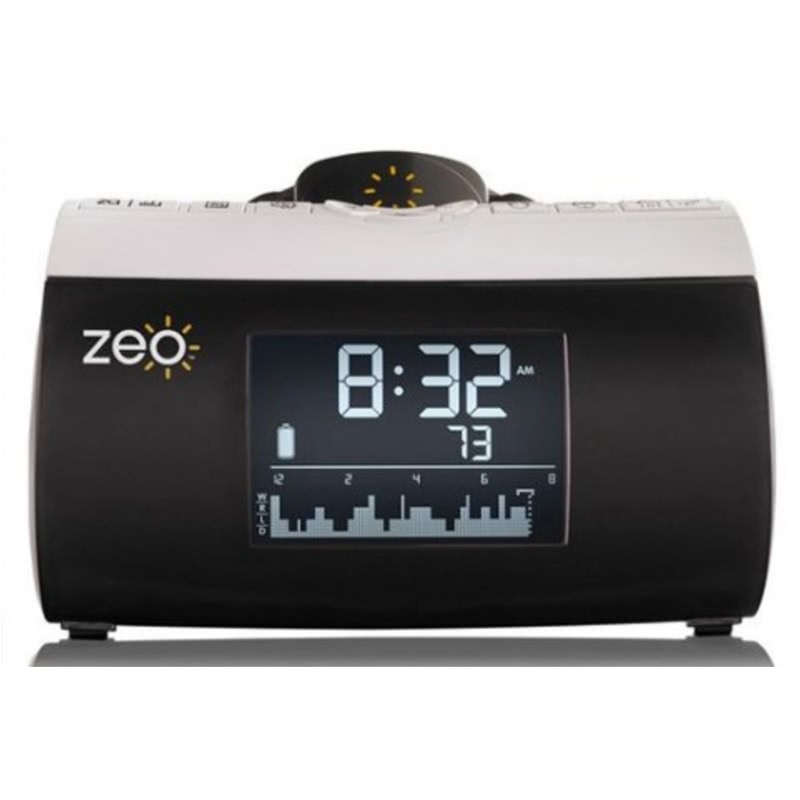 The Zeo Sleep Manager - Bedside Sleep Management System is your solution. Best of all, the manufacturer offers a 30 Day Risk Free Trial. 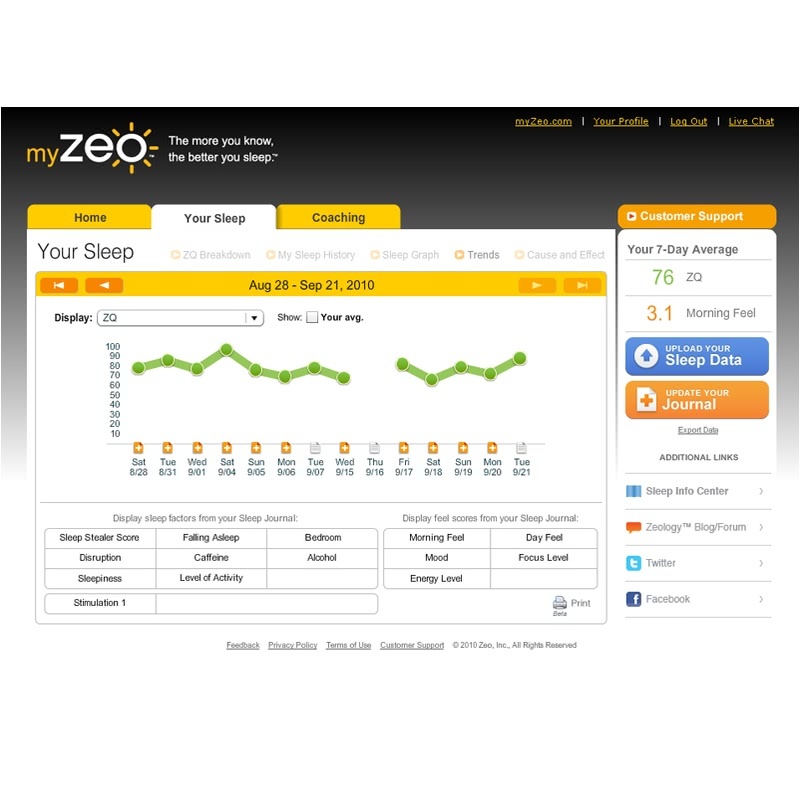 Zeo is a lightweight wireless headband, bedside display and set of online tools that measure sleep patterns through the electrical signals naturally produced by the brain. The headband secures the SoftWave sensor during the night and immediately begins to record your status. The Zeo headband transmits data wirelessly to the bedside display that stores up to two weeks worth of data on the SD memory card. After you rate how that morning feels, the headband recharges on the bedside display cradle. When you are ready, use the SD memory card reader to upload your information from the bedside display into MyZeo Online. Use the web-based tools to uncover adverse sleep factors and track any changes you might make to improve your sleep habits. The bedside display allows users to change SmartWake or alarm clock settings as well as provide quick access to your sleep data. SmartWake triggers your alarm clock at the 'almost-awake' sleep phase closest to your wake time. 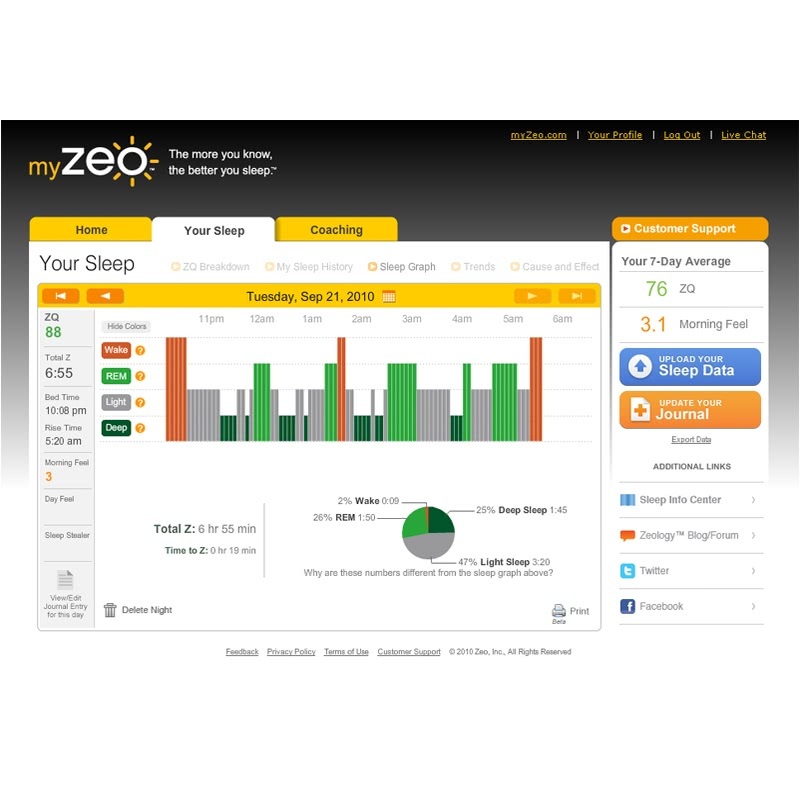 Zeo identifies four sleep cycles: Awake, REM and Stages 3 and 4 deep sleep. A typical sleep cycle takes 90-110 minutes. During Stage 1 of your sleep cycle, you sleep lightly. At Stage 2, your sleep gets progressively deeper. Stages 3 and 4, also known as "Delta Sleep", you sleep the heaviest and your body rebuilds itself. SmartWake is a Zeo algorithm that monitors your sleep cycles and waits for the ideal waking moment such as a Stage 1 or 2 cycle. Set the alarm window to your typical morning wake-up time and Smartwake will attempt to wake you within a range as wide as 90 minutes from your wake up time. For example, a 20 minute window setting for a wake up time of 6:30 would allow the SmartWake to start the audible alarm at the most optimal awake state between 6:10 and 6:50. 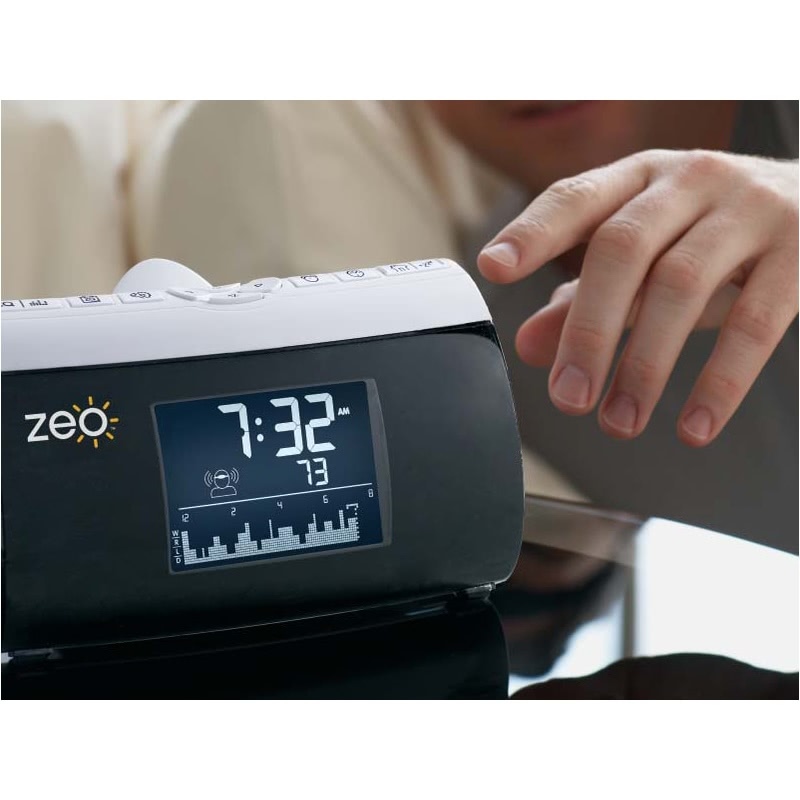 Once a light sleep phase appears, the Zeo alarm begins beeping, gently at first and then progressively louder until you awake. Waking up at the perfect time eliminates the grogginess you experience in the morning. 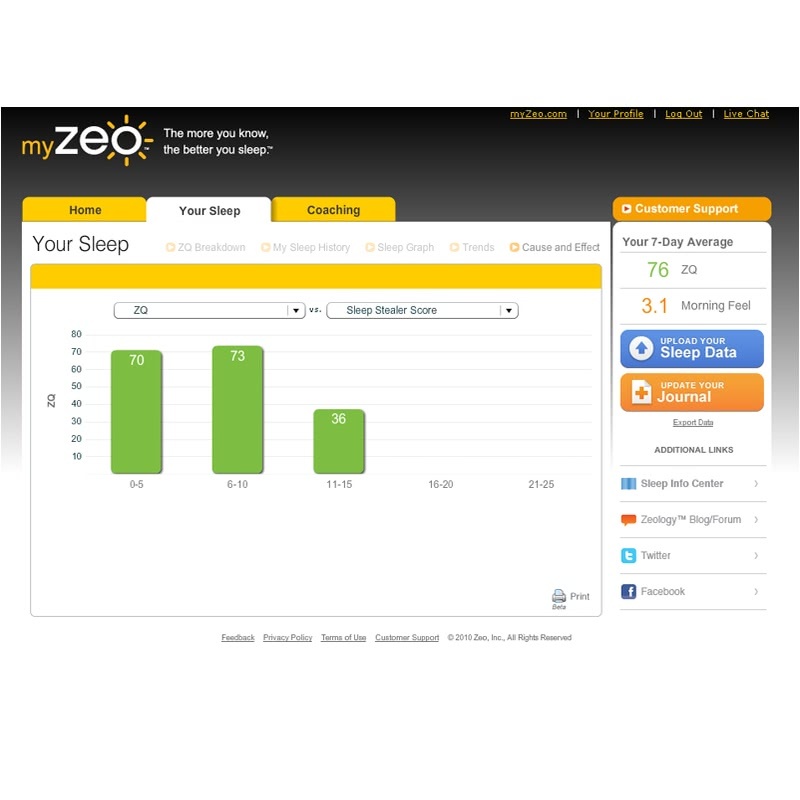 MyZeo is the link between how you live and how you sleep. The interactive website provides a series of tools that help you visualize your sleeping habits. 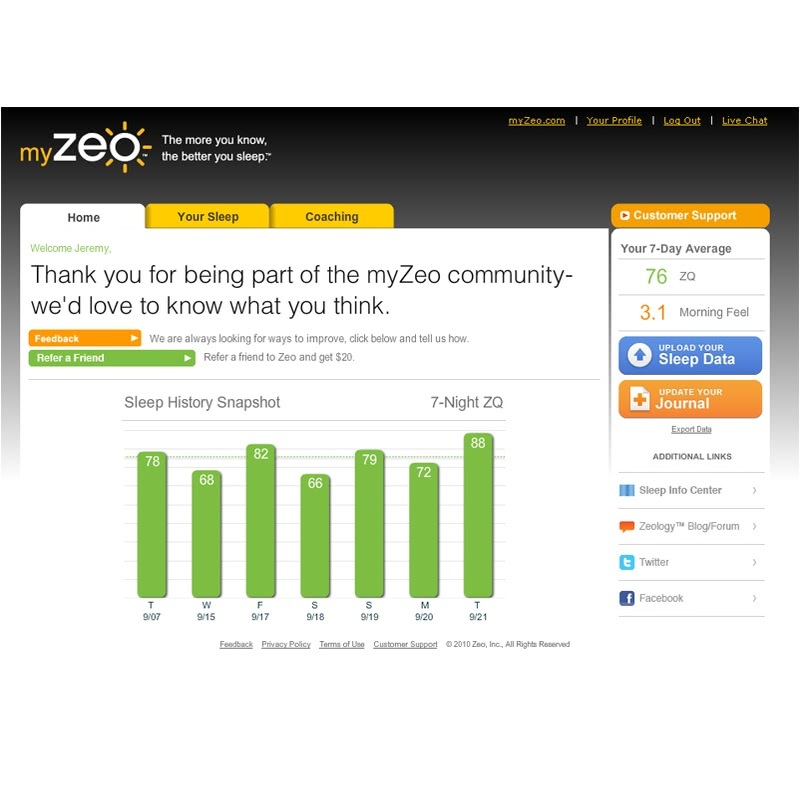 Once you login and register your device, MyZeo lets you upload data and instantly generates graphs for evaluation. Use the Sleep Journal and Sleep Stealer questions to record any factors that may have affected your night. The 7 Sleep Stealers are actually a set of generalized questions that group hundreds of influential sleep factors into seven main categories. ZQ Breakdown explains how ZEO arrives at the ZQ Score. The graph can display key total times for specific days, weeks, or months. The ZQ score is based on the total amount of time you sleep (Total Z) pus the amount of restorative sleep (Deep and REM) minus any disruptions (Time awake and woken). My Sleep History allows you to evaluate particular sleep totals in graph form. Choose from any of the measurements listed above. The graph can display daily, weekly, or monthly totals in ten period increments. 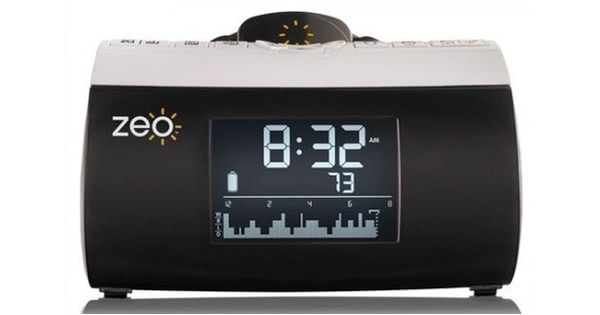 Sleep Graph is a color coded bar graph similar to the sleep phase measurement found on the bedside display. This page also shows the same data within a pie graph and various other measurements like bed time, feeling scores, and Sleep Stealer factors. Trends allow users to see a plotted line graph of specific time totals along with an overlay of a bar graph representing key sleep factors that occurred each day. This view helps compare any sleep factors that may help or hurt your efforts towards a better night's sleep. Cause and Effect is a comparison bar graph of two selected data points (Energy Level vs Morning Feel). The graph will only display the last five days of sleep data. 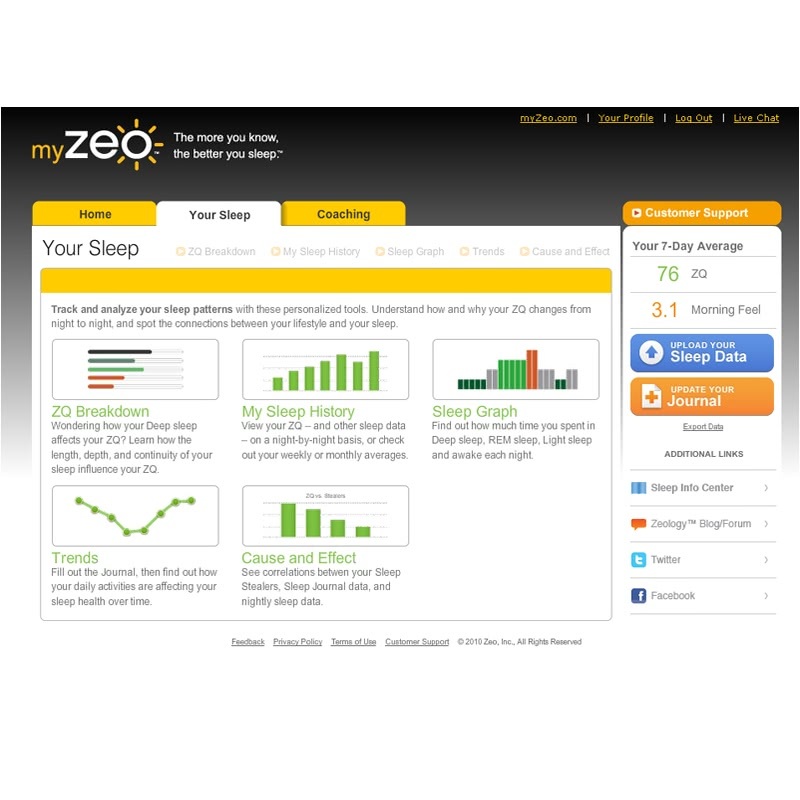 The Zeo is neither a medical device nor a medical program and is not intended for the diagnosis of sleep disorders. 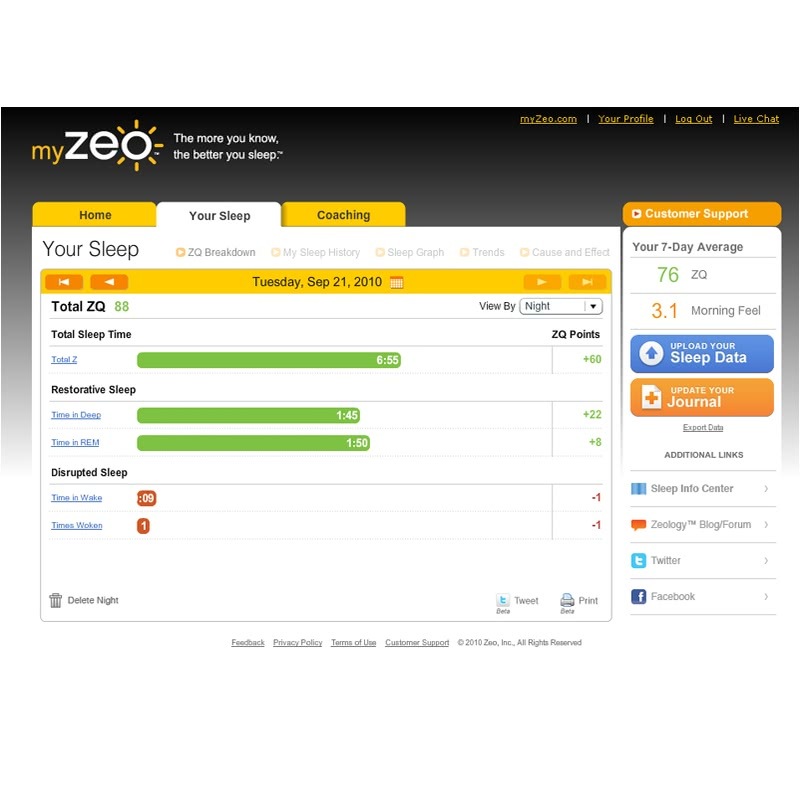 The Zeo is a tool that requires regular participation and driving need to understand whether your lifestyle changes are affecting daily life. 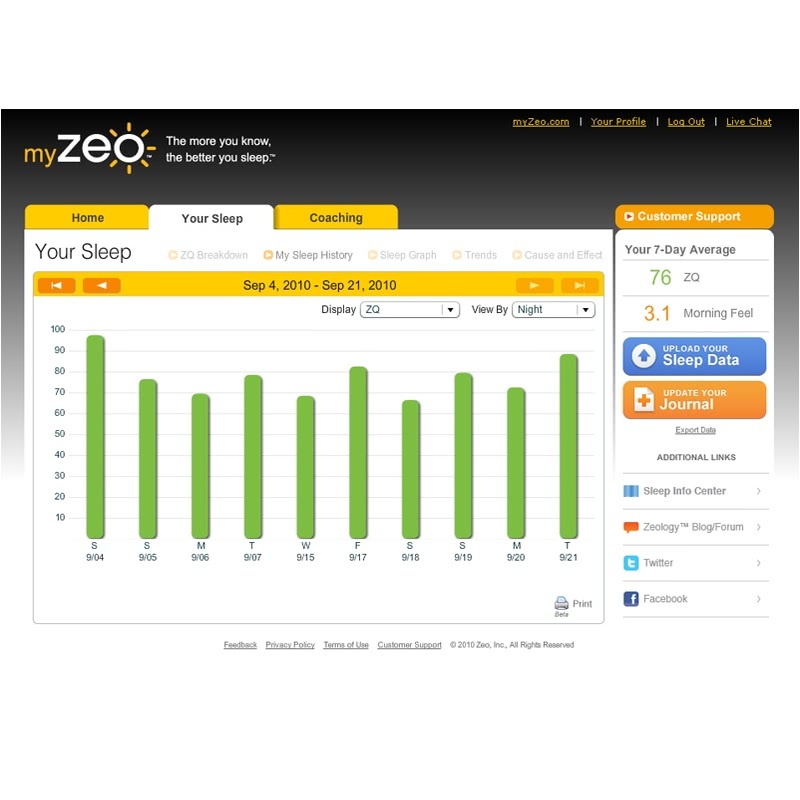 The Zeo comes with a One Year Warranty. Please contact a CSR at CPAP.com for a Return Authorization. The Zeo can be used with either a 110 volt or 220 volt outlet. An additional power adapter plug may be needed if traveling outside of the United States.